Sam Brown has enjoyed a very successful career as a solo artist; Pink Floyd fans remember her for this and for the time she spent singing background vocals and delivering a powerful rendition of "The Great Gig in the Sky" on The Division Bell Tour which can be seen on the PULSE release. She joined the Floyd on the windy and wet stage at Knebworth 1990 as part of that mammoth show. She has also worked with David Gilmour on his own projects, and can be seen in the David Gilmour in Concert recording. She's also worked with other musicians such as Deep Purple and Jon Lord, Gary Moore, George Harrison, Jools Holland, and Nick Cave. Her first two solo albums were critical and commercial successes, and she has spent a number of years performing live, either in her own right, or as an invited guest performer. 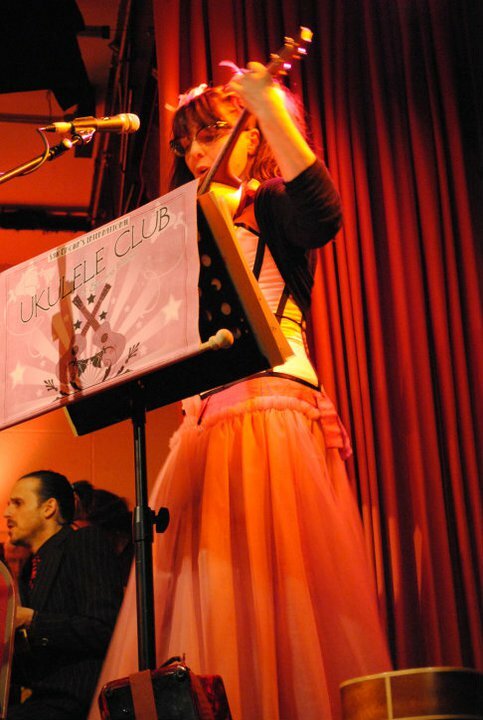 You are currently “the boss” for several ukulele clubs: what do you do in this role? I teach, do all the charts, organise gigs. What drew you to the Ukulele? It was just laying there on the sofa… mocking me!! And I picked it up and wrote some songs. I've always been a piano player, and never really very good with stringed instruments. The uke is much simpler to understand and really compliments the voice. Though it all started with just one ukulele club, this branched out into a handful more, what do you attribute the growth of the clubs to? I think people like it because they can just be themselves, it's relaxed and fun. And it's not TOO difficult if you've never played an instrument before. Plus we have wine and cake! Can anyone join the clubs or does it require a specific amount of proficiency in the ukulele? Anyone can join, although I swear quite a lot, so it's not really suitable for children. The clubs perform a pretty eclectic range of music – from Motörhead to Pink Floyd: what are some other artists you've covered? Gene Austin, The Beatles, The Kinks, Vaughn de Leath, Cliff Edwards, McFly, the Buzzcocks, Johnny Cash, The Ink Spots, and many more. What Pink Floyd material have the clubs covered during live performances? Just "Wish You Were Here"… I wouldn't risk massacring any more songs! It does actually work quite well, although we've now lost our lead uke player as he's gone to live in Australia! Does performing Pink Floyd music bring back a lot of memories: are they particularly emotive? Erm, I just want the song to be right… I do often think of my time with Pink Floyd, but it is a relatively small chunk of my musical career. ALL my memories are good ones, fantastic ones in fact. Do the clubs write original material as well? How is your voice doing – we know you had some difficulties with it – can you tell us what happened and how you are feeling now? I feel fine, one must move forward. But my voice is getting worse rather than better. I still don't know what's wrong with it, but I can't get vocal cord closure and achieve the proper pitch simultaneously. It feels like there are some muscles that aren't working. It's not just my singing voice, it's my speaking voice too, and some days are better than others. I suppose I'm waiting! I think it might be unclear to fans: you still sing, despite the difficulties you’ve had with your voice, right? Well, I wouldn't call it singing. No, I don't sing professionally at all now. I have to 'croak' along to the uke club, so that they know where they are, and I have to teach them melodies and harmonies. But it's not really singing! How did The Division Bell Tour impact your career? It didn't really change anything. I was working as a backing vocalist, and not doing my own material, so it didn't really have an impact on my career. I expect the exposure was good for me and alerted more people to my existence, but Pink Floyd fans want Pink Floyd! Do you see Pink Floyd fans at your ukulele gigs? No. Well… there are quite a few in the uke clubs. We know you joined David Gilmour onstage in Paris back in 2006: do you stay in touch with Gilmour, Nick Mason, or any other touring band members from the Division Bell Tour? I stay in touch with David, and occasionally see other members of the group. My lifestyle is very different to theirs, so our paths rarely cross. Is there a chance you might play the uke on a Gilmour album sometime in the future? I have no idea. It is always great to work with Dave, I've learned a great deal from him, and am always chuffed to be asked to be involved in any way. I do think it fairly unlikely that he will want a ukulele player in the near future though! You have some gigs coming up in December – they are posted on your website. Any plans for 2014? Yes, we do have a few gigs on the go! 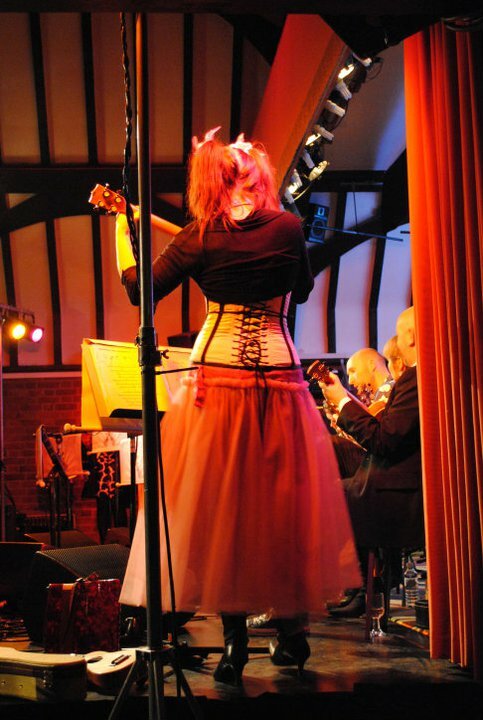 6th and 7th of December at Shiplake Memorial Hall (like the Albert Hall, but a bit smaller! ), and we are playing The Kenton Theatre in Henley on Thames on the 12th, although that is now sold out. There are also various charity gigs, such as the Sonning Common over 60's lunch… so very rock and roll :) ! Next year, there will, I believe, be 100 ukuleles at Fawley Hill in May. There will be lots of appearances at various fetes and fundraisers throughout the summer. To be honest, the glamour of it all is quite overwhelming. Our thanks to Sam for updating us to her activities. All pictures here are courtesy of Sam herself. 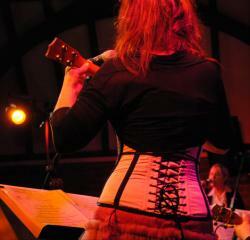 For more details of The Fabulous Ukulele Club visit the cunningly titled www.thefabulousukuleleclub.com.